Beebe Healthcare launched CareAware Connect™, a new mobility and communications solution for healthcare professionals. CareAware Connect looks like a cell phone, but it is used to provide communications, alarm management and nursing workflow tools on a single device. The devices allow clinicians to make voice calls inside and outside the healthcare facility, send HIPAA secure text messages and review clinical electronic medical record data and alerts on their smart phone device. Patients and visitors to Beebe Healthcare can expect to see nurses and health professionals using the phones. These phones are not for personal use; they are solely used for patient information and secure communication about patients. In addition to CareAware, Beebe Healthcare also unveiled Capacity Management, which allows healthcare teams to get an overview of all the patients in the hospital. These programs were possible because of a partnership between Beebe Healthcare’s Information Systems/Nursing Informatics teams and Cerner, a health Information Technology company. The project to bring the technology to Beebe started in September 2015 and resulted in a successful go-live in early April. 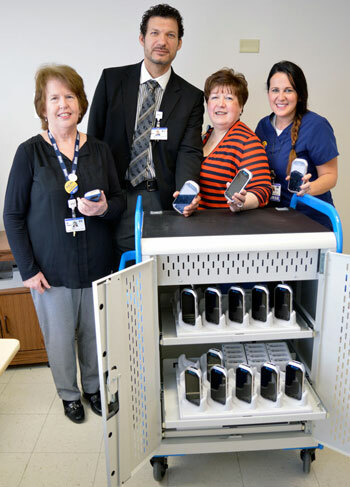 Shown are (left to right) Nancy Nonne, Ricardo Diaz, Kathy Podbesek, and Jamie Dickerson of the Beebe Healthcare Clinical Informatics Department.